A short biography of French anarchist geographer and writer, famous for his travels, Elisée Reclus. French geographer, was born at Sainte-Foy la Grande (Gironde), on the 15th of March 1830. He was the second son of a Protestant pastor, who had a family of twelve children, several of whom acquired some celebrity either as men of letters, politicians or members of the learned professions. His education, begun in Rhenish Prussia, was continued in the Protestant college of Montauhan, and completed at the university of Berlin, where he followed a long course of geography under Karl Ritter. Withdrawing from France in consequence of the events of December 1851, he spent the next six years (1852-57) visiting the British Isles, the United States, Central America, and Colombia. On his return to Paris he contributed to the Revue des deux mondes, the Tour du monde and other periodicals a large number of articles embodying the results of his geographical work. Among other works at this period was an excellent short book, Histoire d’un ruisseau, in which he traces the development of a great river from source to mouth. In 1867-68 he published La Terre; description des phénomènes de la vie du globe, in two volumes. During the siege of Paris while the Paris Commune was underway, Reclus shared in the aerostatic operations conducted by M. Nadar, and also served in the National Guard, while as a member of the Association Nationale des Travailleurs he published in the Cri du Peuple a hostile manifesto against the government of Versailles in connexion with the workers’ rising of the 18th of March 1871. Continuing to serve in the National Guard, now in open revolt, he was taken prisoner on the 5th of April, and on the 16th of November sentenced to transportation for life; but, largely at the instance of influential deputations from England, the sentence was commuted in January 1872 to perpetual banishment. Thereupon, after a short visit to Italy, he settled at Clarens, in Switzerland, where he resumed his literary labours, and, after producing the Histoire d’une montagne (a companion to Histoire d’un ruisseau), wrote nearly the whole of his great work, La Nouvelle Géographic universelle, la terre et les hoinmes, 19 vols. (1875-94). This is a stupendous compilation, profusely illustrated with maps, plans, and engravings, and was crowned with the gold medal of the Paris Geographical Society in 1892. An English edition appeared simultaneously, also in 19 vols., the first four by E. G. Ravenstein, the rest by A. H. Keane. Extreme accuracy and brilliant exposition form the leading characteristics of all Reclus’s writings, which thus possess permanent literary and scientific value. 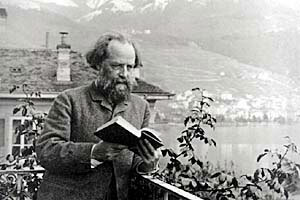 In 1882 Reclus initiated the "Anti-Marriage Movement," in accordance with which he allowed his two daughters to marry without any civil or religious sanction whatever. This step caused no little embarrassment to many of his well-wishers, and was followed by government prosecutions, instituted in the High Court of Lyons, against the anarchists, members of the International Association, of which Reclus and fellow anarchist geographer Prince Kropotkin were designated as the two chief organisers. The prince was arrested and condemned to five years’ imprisonment, but Reclus, being resident in Switzerland, escaped. Edited by libcom from the 1911 edition of the Encyclopedia Britannica, pages 957-58 with more information added.